In this episode of The Agilistocrats, Richard Cheng from Excella Consulting, Dhaval Panchal from Agile 42 and I (Dave Prior from BigVisible) discuss some of the common misconceptions people coming from a traditional (waterfall) background have when they come into Agile Training classes. Knowledge workers coming from a waterfall backgound, especially those of us who have put in the time and effort to get a certification like PMP, face very specific challenges in learning how to let go of how we were taught to work. We may not believe that the traditional model works, (according to The Standish Group, IT Projects only succeed between 30%-40% of the time) but that does not necessarily mean we are ready to embrace an intrnalize an Agile way of looking at work. 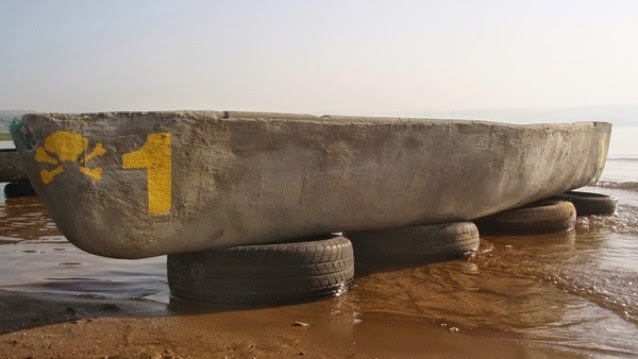 During the podcast we spend time sharing the different things each of us does in class to try and help folks let go of the concrete liferaft. 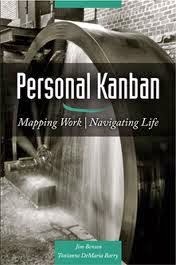 Personal Kanban Week 6 - What if you mix the mayonaisse in the can, with the tunafish? Track Your Happiness - What Makes You Happy? Downloadable versions of tabloid sized PDFs of the canvas tools are available with each. In celebration of the fact that the 2014 Digital PM Summit is less than a week away... some DrunkenPM / LouderThanTen podcasty mashup goodness... Rachel Gertz and I discussing the question of whether or not project managers should go through social engineering training to better enable them to understand more of what people are sharing with them and also to help them be better able to tailor how they are messaging the information they are sharing. If you will be in Austin for the conference next week, Rachel is co-presenting with Carson Pierce on Monday, October 6 at 2 PM. Her session is called PM First Aid: Bring Your Projects Back From The Dead and my session on Personal Kanban will be on Tuesday at 11 AM. 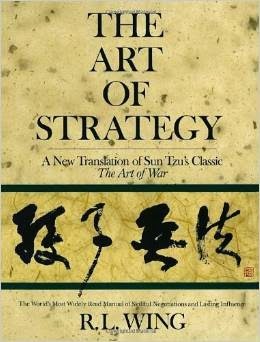 The Aikido book referenced in the podcast is Aikido: Principles of Kata and Randori by Nick Lowry. You can pick it up here. Chris Matts is an Agile though leader and coach based in the UK. 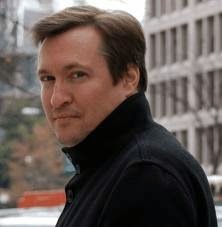 He’s also co-author (along with Olav Maassen and Chris Geary) of ”Commitment: A Novel About Managing Project Risk”. What makes the book so unique is that it is a graphic novel. The purpose of the story is to help the reader gain a deeper understanding of how to make truly informed (right) decisions based on a deeper understanding of the issues they are facing. Chris is currently focusing his coaching efforts on how Agile works in the enterprise. If you’d like to learn more about the work he is doing, check out the podcast here. You can connect to Chris on LinkedIn here. The 2014 Digital PM Summit IS ONLY TWO WEEKS AWAY! Sign up at http://www.dpm2014.com/ and you'll spend two day in the company of a few hundred project managers and digital media professionals who are part of a growing community of passionate, committed, creative people who are incredibly energizing to be around. If you'd like more detail on why this conference is so inspiring, check out the Digital PM Radio interview I did. It was a little weird to be the one being interviewed for a change, but I had a great time. Carl Smith a great interviewer. Richard Cheng from Excella Consulting, Dhaval Panchal from Agile 42 and I (Dave Prior from BigVisible Solutions) have started a new series of podcasts focusing on new topics and current trends in Agile. In this podcast we got together to talk about some of the key topics from the Agile 2014 Conference and the current push for Agile in the Enterprise. This is our first recording and we're looking for feedback (and a better name). Give a listen and let us know what you think. We'd also like some ideas for new topics to focus on in our next recording. So if you have ideas or questions, please send 'em to agilistocrats@gmail.com. 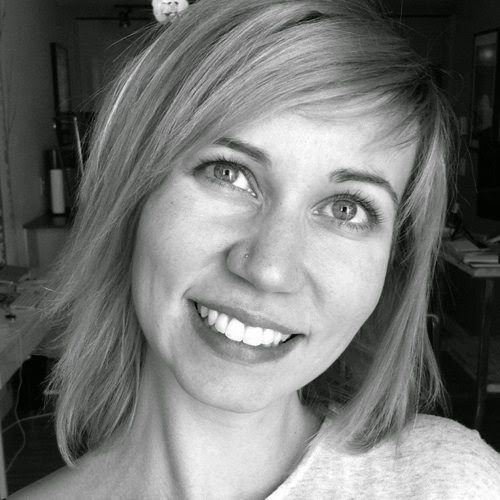 Earlier this week we posted a podcast interview between myself and amazing Rachel Gertz from Louder than Ten. Once of the topics we talked about was the idea of providing training in Social Engineer for PMs and Team Leads. For me, this is one of those topics I found my way to on my own, but really wish I had learned more about it earlier in my career. For many PMs, Daniel Goleman’s Emotional Intelligence is a gateway towards the work of people like Dr. Paul Ekman. Once you begin learning how to be aware of and understand the unintentional information being communicated the natural next steps are to figure out what to do with that information and how to make sure the information you put out is what you want it to be. And this is where you’ve crossed over into Social Engineering. Social Engineering is kind of a touchy subject with some folks. It tends to evoke an almost reflexive response that stems from the idea that a social engineer is an evil person who is out to do us harm. (Think Kevin Mitnick as portrayed in Takedown or Roy from The Grifters.) While there are plenty of people out there in all areas of life that are trying to grift or con their way into out lives and wallets. 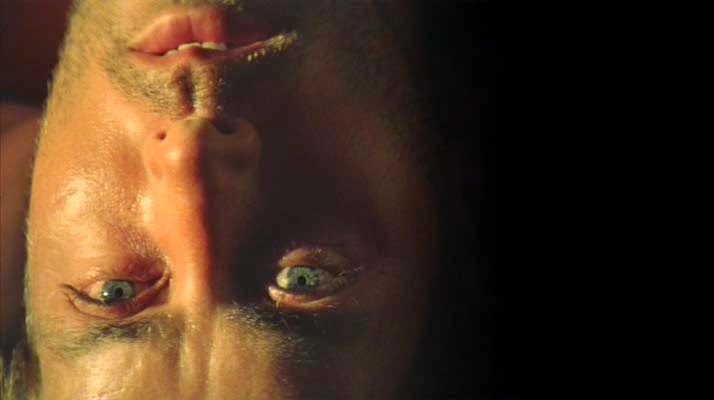 I would like to offer a different view. And if you work in technology, leading projects or teams, you’ve probably already been exposed to things like Emotional Intelligence, Neuro-Linguistic Programming, Non-Violent Communication, Situational Leadership (just to name a few). Developing your abilities in social engineering is a way to enhance or compliment your abilities in each of those areas. Whether we are interacting with co-workers, our spouse, our children, the airline rep at the customer service counter in an airport full of angry travelers, we’re all trying to get something. I want my daughter to remember to stop leaving dirty dishes in the living room. I need the developers to start commenting their code. I want to get bumped up in the standby list. I want to take my wife to dinner at the Indian place instead of the noodle shop. These are all simple things we face every day. Wanting them is neither good, not bad. Whether it is done with conscious intent, we are all trying to bend situations in a way that results in an outcome we desire. If you are a project manager you probably spend a lot of your time trying to find ways to get people to do things you want them to do, or work the way you want them to work. If you are a Scrum Master or an Agile Coach, you spend a good part of your day trying to figure out how to get people to want what you want them to want. 2. It can enable you to become better at modifying your own verbal and non-verbal output in a way that will sway an interaction more towards your desired outcome. If the success of the projects we work on hinges on communication (PMBOK 5th Edition Appendix X3.4), then our ability to understand what is being communicated and to manage what we communicate, is our greatest asset. Deepening your understanding of things like micro-expressions, changes in body language, conversational techniques for building rapport can only strengthen your ability to communicate. It helps you unpack the messages sent by others and can help you wrap up the messages you are sending with conscious intent. While it is unlikely you’ll end up like Sherlock or the guy in Lie to Me, simply becoming more mindful of these concepts will give you an edge and help you in your work with teams and individuals. The first step is educating yourself (some great starter resources are listed below). The second step is finding places to actually practice (in a non-career limiting, non-marriage limiting environment). The practice part can be tough - especially when you are just starting, but you’ll want to build skill and confidence before your start trying to use some of your new tools at work. 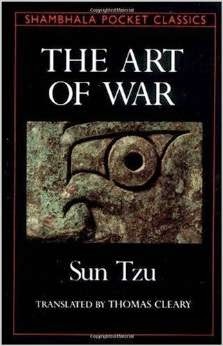 uce into our own signals as we communicate with others. 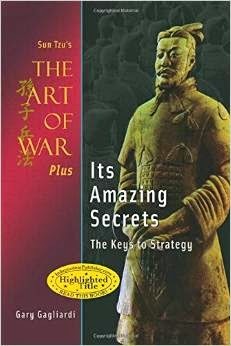 Here are two books I’ve read recently that I recommend as a great starting place if you are interested in learning more about Social Engineering. If you are coming from the traditional side of the house and you are probably all too familiar with the types of training classes, workshops and conference sessions where you have the opportunity to hone your ability to sleep with your eyes open while someone stands at the front of the room and reads slides to you. My most memorable (worst) experience with this was a lecture at a project management convention where one presenter read the words on each of his slides to the audience while his co-presenter sat next to him doing email… FOR AN HOUR. At some point you have to ask yourself… is this any way to learn? For a number of years now the way people teach, and learn has been changing. In general, people tend to learn, and retain a little more when you give them something to do, and even more so when they have the chance to arrive at the light bulb moments on their own. The game was simple; whichever team was able to build the tallest freestanding structure in 18 minutes, with the marshmallow on top, wins. During the 18 minutes the team members collaborated on trying different techniques to determine what the most effective approach to a relatively stable structure might be. 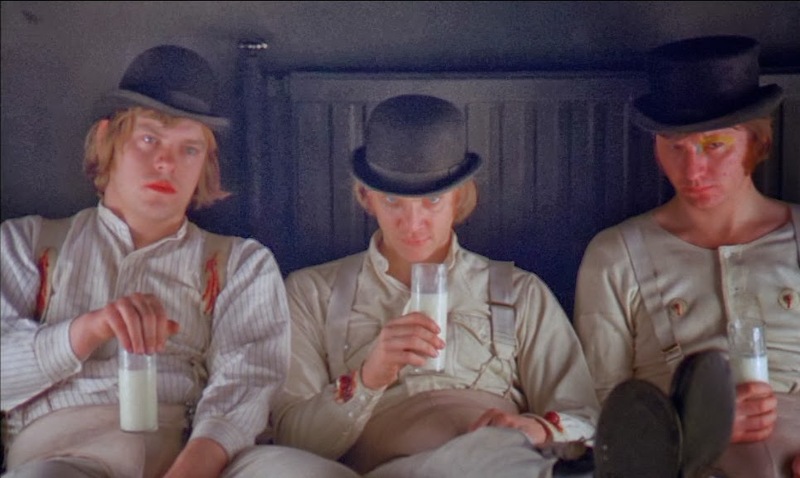 There were moments when it took turns being comical and heartbreaking, but in the end, a clear winner emerged… so what does that have to do with working in IT? The Marshmallow Challenge was created by Tom Wujec to help teams learn lessons about creative collaboration and innovation. To the uninitiated, activities like this can seem a bit off-putting at first. In my own experience teaching PMs, I find that often times, the desire of the room is “feed my brain, don’t make me interact, and let me go stumble through this on my own”. That is certainly one way to go about it, but more often than not, those same class participants end up discovering that by actually getting involved with their classmates, and collaborating on something fun, can lead to unexpected and very valuable lessons they would not have learned in a straight up lecture style class. These types of games are very common in Agile trainings. Organizations like Luke Hohmann’s Conteneo have focused their efforts on promoting Innovation Games as a great way of enabling organizations of knowledge workers to deepen their learning experience. These types of games extend well beyond the class room and are used by many organizations as a way of learning more about their business, how to collaborate and interact in a collaborative, and highly creative manner. Having trouble understanding what isn’t working with your existing products or service offerings? Maybe a little SpeedBoat would help. Does your organization want to get a simple taste of what it would be like to switch to Scrum? Head over to Agile42 and try the Scrum Lego City game. If you are having trouble understanding how to cope with the challenges you are facing with Distributed Teams, TastyCupcakes is where you’ll find the Epic Bedtime Story. And if you want to get some practice at helping a cross-functional team get better at continuously improving how they work together, you might try my personal favorite, Flavio Steffens The Airplane Factory Game. Warning, if you believe that anyone who ever built paper airplanes as a child will have retained that skill as they reached adulthood, you may find this exercise a little soul crushing. Unless you are in France, where each paper airplane is like a beautiful work of engineering and art… it’s flying them that is the problem. While most of these games were initially designed to be done in a setting where everyone was physically present, many of them are now available in online versions as well. In each of these games, what helps people reach moments of insight is the creative learning play that occurs through working together in a fun atmosphere. Whether you are putting together a class, or just trying to discover a new way to help a group of professionals come up with unique solutions to a business problem, the collaborative play these games offer is a great way to find those light bulb moments. Digital PM Summit is coming up fast. It takes place in Austin on October 6-7. If you're needing project management inspiration, this is your Philomath. 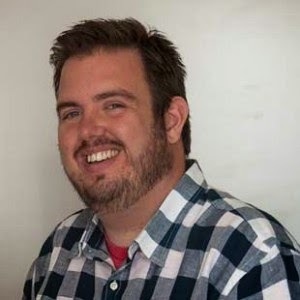 Check out my ProjectsAtWork interview with Brett Harned who in addition to being the VP of Project Management for Happy Cog, is one of the primary organizers of the event. Rachel Gertz from Louder than Ten and I having a conversation with about the way Aikido, social engineering, body language and Project Management all intersect. This will be the first of many podcasty-ish chats. Thoughts/comments, feedback, hurled shoes would all be greatly appreciated. 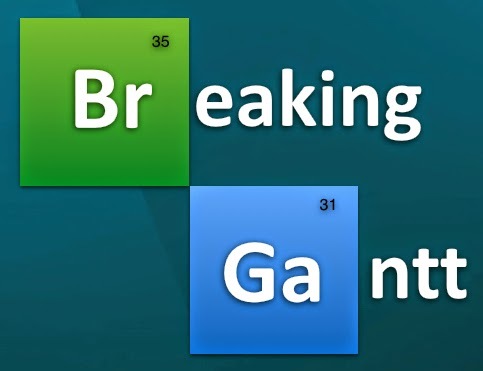 I'm going to be doing a webinar called Breaking Gantt for Project Management.com on October 1, 2014. In this webinar I'll be presenting some tips and tools I have found to have a positive impact when helping an organization let go of their dependence on traditional project tracking in favor of Agile reporting. For me, I ask that question all the time. 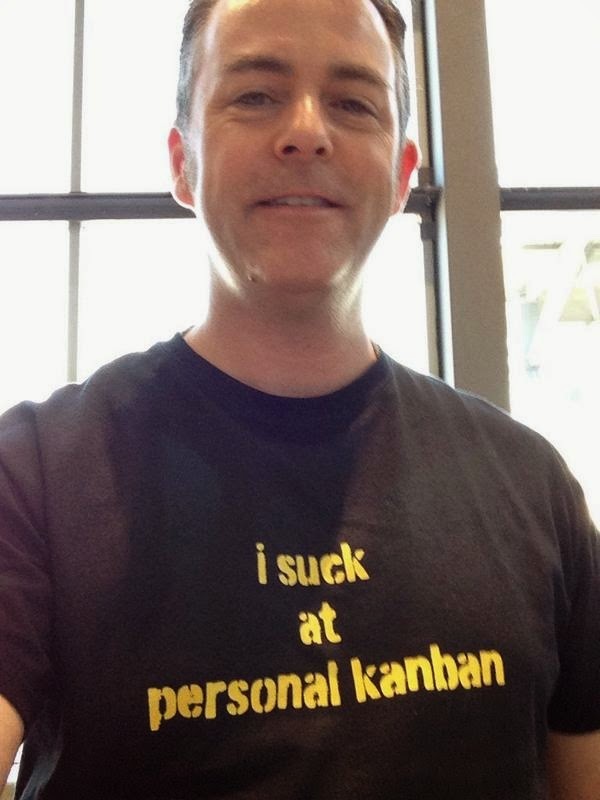 I wear my hard earned experience in waterfall as a scarlet PMP that has been seared into my soul. When I was taught about project management, the guy who taught it to me started by saying “When I’m done with you… everything is a project.” And with that statement, he began to re-wire my brain. Once you learn to see things the way a PM does, there is no going back. And no matter how long I practice Agile, that will always be with me. I am a project manager in recovery. The good part is, that if the question is “How will I know when I am Agile enough?”, I already know the answer… Never. The moment you think you’ve got Agile sorted is the moment you stop being Agile. So, somewhere in the back of the Agile recesses in the brain, you need to nurture your inner Captain Willard. I often get the question about being Agile enough when I am teaching Scrum classes to PMs or people who are deep with the waterfall. They either want to know the “right” way to do it, or when they are “done” learning it and can say they are Agile. I decided to work on developing some way to address the question that would be both simple to use and relevant for people who are just stepping out of the waterfall, and people who have been doing Agile for awhile. The result is the Personal Agility Canvas. 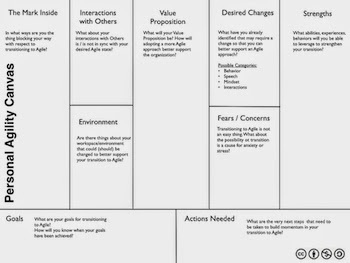 The Personal Agility Canvas is modeled after the Business Model Canvas (which you can learn more about here. I kept the basic layout because I thought it might be somewhat familiar and that might make it easier for people to digest. 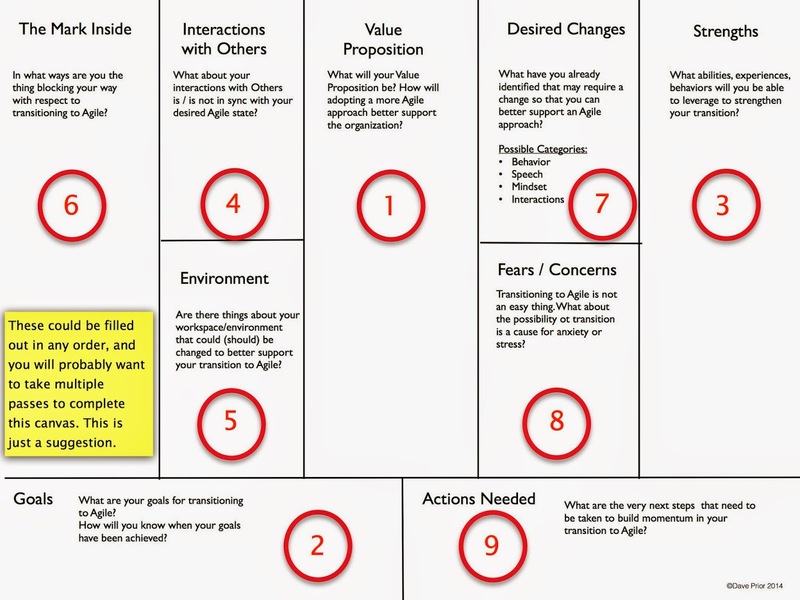 The Personal Agility Canvas is intended to be a way to personally reflect on your ability to improve your approach to Agile, establish goals, and develop a plan to achieve them. It is not intended to be something you fill out and then are done with. This is intended to be something you come back to again and again as part of your own personal effort to inspect and adapt. In teaching the Personal Agility Canvas during the Redefining the PMO workshops, I have found that not providing step by step guidance on how to work through the different boxes can cause result in stress for the students. To help get you started, here is an example which has the boxes numbered (hyperlink) according to the order in which I normally teach them. In my own use of it, I begin with Goals, then move to Value Proposition and iterate repeatedly through the boxes until I am ready to define the Action Plan. If you are creating your own Personal Agility Canvas, I’d recommend working through the boxes in whatever way makes the most sense to you. As long as you end up with a measurable Action Plan at the end, it’s all good. Value Proposition - What is your personal value proposition? How do you deliver value to the teams you work with, the company you work for? How will an improved approach to Agile better enable you to serve your team(s) and organization? Strengths - What abilities, experiences, behaviors will you be able to leverage to strengthen your transition to Agile? Fears/Concerns - What about Agile, or transitioning to Agile causes you anxiety or stress? How does this impact you? Environment - What about your (individual and/or team) physical workspace is impeding your ability to improve your approach to Agile? The Mark Inside - This will likely be the most difficult box to complete. William Burroughs said “Hustlers of the world, there is one Mark you cannot beat: The Mark Inside.” The idea here is that whether we are aware of it or not, each of us is often our own worst enemy. We con ourselves without even realizing it. How are you blocking yourself from truly embracing an Agile approach? Where are you second guessing the thought leaders who have come before you or hedging your bets with your practice? Actions Needed - After completing all the other boxes and re-reviewing your goals, you need to develop a plan. These should be concrete steps you can take in the short term to help you move towards becoming more Agile. Once you have completed these actions and achieved the goals, it is time to start your canvas all over again. One last suggestion. Find someone you trust who will give you honest feedback and hold a mirror up to show you things you cannot see. By sharing your canvas with an accountability partner, you can make a commitment to someone other than yourself. Ideally, each of you will pursue these goals because this is something you are committed to, but there may be times when your motivation lags. When this happens, it may help to have a voice in the back of your head reminding you that you promised someone you’d have it done and that they are expecting to hear from you when it is finished. 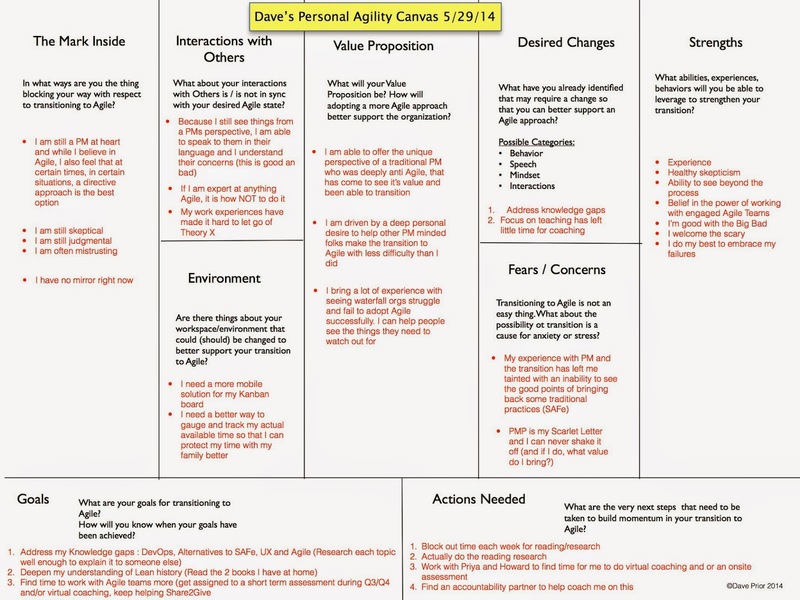 And on that note… here is an example of a Personal Agility Canvas I completed for myself earlier this Spring. If you have any feedback on the canvas, how it is working for you, what might make it better, please let me know. I do not expect that this current version will be the final one, but it is the one I am using now. 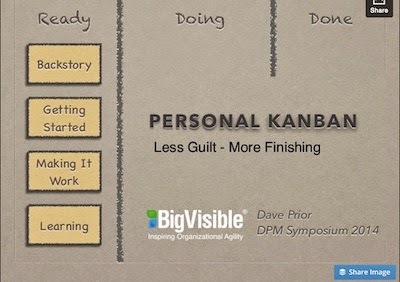 If you’d like to learn more about how the Personal Agility Canvas works, it is part of the session I am leading for Redefining the PMO and I will also be giving a presentation on it at Agile 2014 this summer. Click here to go straight to the podcast. 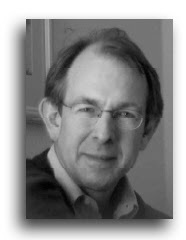 A few weeks ago I had the opportunity to interview Ron Lichty, Agile throught leader co-author and of Managing the Unmanageable: Rules, Tools, and Insights for Managing Software People and Teams. One of the great things about the books is that Ron and his co-author Mickey W. Mantle have culled their collective experience and offered up a set of tools they have found useful over the years in working on software projects. Ron and Mickey take the approach that software developers are a unique group within the knowledge workforce and that they require an adjustment in how we treat them, how they treat each other and what we can do to help them work with non-developers. 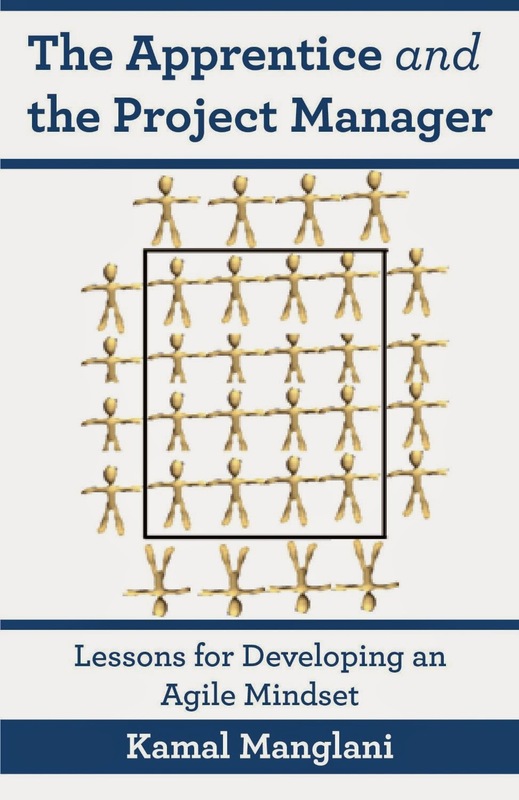 One of Ron’s current areas of focus is rooted in the question of “Why do we need managers if Agile teams are supposed to be self organizing?” Ron’s has found that only about 5% of software managers have had actual training in how to manage people. We basically just expect developers to be able to move into a managing role and just know how to do it based on their experience in not being a manager. Ron looks at the critical role that management can make in helping companies transform to Agile and the importance in making sure that they are trained both in management AND in how Agile works so that they can be better prepared to help, rather than impede the Agile teams as they are getting off the ground. You can find the podcast interview here. 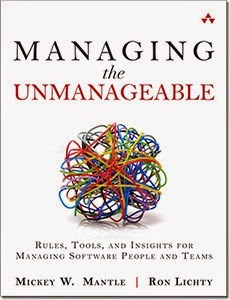 Ron’s book “Managing the Unmanageable: Rules, Tools, and Insights for Managing Software People and Teams” can be found here. 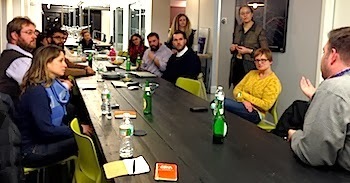 @brennaheaps kicks off the March PhilaPM Meetup by asking a room full of Digital PMs if any of them have had to overcome an overwhelming challenge with a team. By traditional PM standards, this is an odd question. Answering it requires admitting there are times when you don’t know what you are doing and are way out of your depth. This is not the way of the traditional PM. If you admit not knowing everything, you demonstrate WEAKNESS and might lose CONTROL. If you have no CONTROL, how can you MANAGE PEOPLE? By Agile standards, it’s not an odd question. It’s an “it depends” question. HELP! We have to overcome an overwhelming situation. What do we do? It depends… what does the team want to do? But the team is not here. The PM is here. The PM is supposed to conduct the mayhem and find a way to create music. Once the question has been laid down for the room, however, the sharing begins. Several of the PMs around the table offer stories of impossible situations they’ve faced. These aren’t the kind of challenges that can be addressed with a change to a contract or a revised scoping doc. These are the “we had it sorted and then the bottom fell out of the world” problems. The ones you couldn’t have seen coming and which leave you with no good options. These are the problems you give talks about at conferences for the next five years. Only right now… some of these folks need solutions to test out. As the PMs in the room begin examining the different situations, it’s a crowd-sourced triage of the situation and options. Some of the suggestions offered have already been tried. Some helped a little, some not so much. There are some new ones though and some of them might work... so at least, there is hope. At the very least, there is a supportive crowd of people who do the same type of work and share the same type of challenges. If you’ve been working in project management for any length of time, you’ve been involved with the meetings that take place at the end of projects. These project reviews or post mortems are generally a wee bit heavy on blame side and a bit light on the learning to improve side. That is, assuming you are actually doing them. If you are working with Agile, hopefully you are doing retrospectives so that your team can get together to explore how to improve how they work together. Retrospectives are one of the best parts of Agile and a great thing for the team… but this is a little different. This meeting, which is hosted by Happy Cog is none of the above. It is, however, one of the more interesting characteristics of this segment of the PM population. Digital PM has been around for a while, but only in the past few years has it begun to identify itself as a somewhat separate group. This meeting is full of PMs from different companies. What they have in common is that in one way or another, they all manage projects that are involved with digital media. Some of their projects are less than a month long. Some last more than a year. Some of their clients demand a traditional approach to managing the work. Some demand an Agile approach. The PMs working in these organizations are generally working with fairly small, design centric teams. Their hybrid model is evolving from needing to be able to work a variety of ways, but being able to fully lock into neither. Their agility is their flexibility and this sharing is part of their approach to continuous improvement. Ten years ago, the project management that existed in this space was simple, basic and practiced by people who were just beginning to cut their teeth. Now it is led by experienced professional project managers and leaders who are schooled up in Agile and waterfall and are collaborating on hybrid tools and techniques that allow them to leverage the best of both. 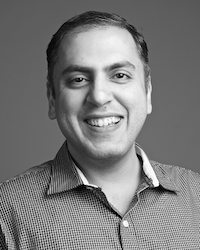 Their pragmatic, collaborative, framework agnostic approach to finding the best way to work with the team and deliver for the client is an exciting and emerging thing. because my need for _trying to figure out if I can actually do it_ is/is not met. Would you (I) be willing to _man the hell up and give it a frigging chance__? To be fair, I do spend an inordinate amount of time pondering it each day – especially when I’m driving… and get cut off by someone who very clearly has a more urgent need to get someplace than I do. because my need for _deleting him/her from the road/universe_ is/is not met. My intent in writing about this is, in part, to express that while I am working on it, I am honestly struggling with adopting NVC. A lot of how I have learned to communicate seems to be at odds with NVC practices. It is important to me, in writing about this, that I be as transparent and honest about how it is going as I can because if there are other people like me who are struggling with this (read: grew up in Philadelphia), I would like to make sure they know that they’re not alone. And to consider that maybe having trouble with this is not necessarily a bad thing, but is perhaps more about letting the dissonance from the conflict reach a level where change happens. My experiment is to see if I can adopt NVC as a practice of (initially) communicating and (ideally) of approaching other aspects of my life. My practice (or not) so far has basically involved me noticing how I react to things, like being cut off while I’m driving or some other social injustice, which has been done to me by someone. Typically, the social injustice has very little to do with the other person and is really just me spazzing out in my reaction to something I have decided is a great crime against all things good in the universe. But, if I did have a rocket launcher, I’m pretty sure that by this time, very few people would be willing to cut in front of me in line at Walmart. 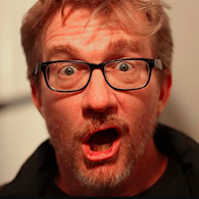 Because I have decided to don my cloak of self imposed guilt for not automatically laying down the communication habits I’ve developed over the past 40+ years in favor of a non-violent approach to life, the universe and everything, I have become hyper-aware of how non non-violent my speech actually is. 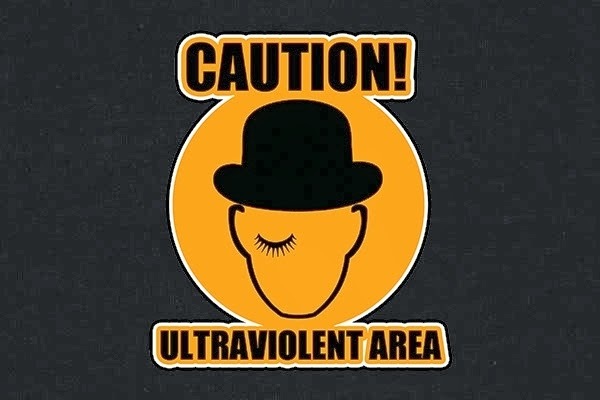 This has led me to wonder if perhaps I am not more suited for a new approach called UVC – Ultra Violent Communication. I do believe that this awareness, is very important. I do not know yet if I will be able to adopt NVC. I do know that while I am able to understand that it is more than just a communication pattern, I have trouble internalizing that. (Much the same way some people respond to the idea of a team being self organizing by winking at me in class and whispering “Yeah, but really… who’s really in charge?”). I also have observed that letting myself freak out about someone cutting me off on I-35, or having the insane gall to try and get past TSA with a bottle of water in their backpack (Whiskey Tango Foxtrot) gives me a bit of an adrenaline rush. Yelling a string of obscenities from within the safety of my car at some motorist I do not know, helps no one, but the release of anger is a boost, and I have become aware that a) the outburst does nothing to change the situation in any way and b) the pull of the boost can be a wee bit habit forming. The more aware of this I become, the more I am finding that when I recognize an of an event and become aware of my emotional response, there is an increasing delay now before my reaction triggers. More and more, that delay is becoming large enough that I have the time to make a deliberate decision about what is going to come out of my mouth. So, in on the whole transparency front, I’m not really delivering on my intent with non-violent communication yet, but in my continuing efforts to get there, the awareness is helping me cultivate a slightly less-violent communication… at least most of the time.